Look Closely. What do you notice about these two pictures? In the second picture, the black couple is missing. The poster on the left was for U.S release and the poster on the right was for British (or European, depending on the news source,) release. Universal Studios' original response to someone highlighting the difference was that they wanted to focus on the "most recognizable stars" for the international release. Yes, because Jean Reno and Malin Ackerman are huge international stars. I can't turn on E! Entertainment television without hearing about Brangelina and Maliwhomeverhe/sheismarriedtonameshmooshedwithhis/hers. Universal later put out another statement saying that they were sorry if anyone was offended. 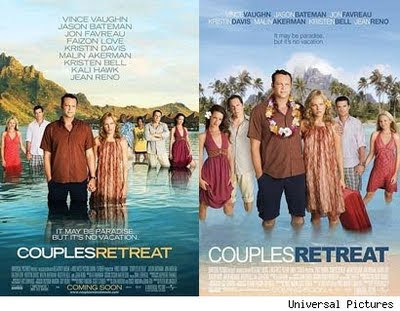 They also said they would discontinue the use of the second poster. I'm just wish I could have been a fly on the wall at the meeting where they decided to photoshop out those two actors. I wonder why no one involved with this whole process wasn't like, "Hmm...this has the potential to be offensive to a large number of people--maybe we should reconsider." What kept that from happening?